Studio Line: Columbia TriStar - It Must Be Found. Two hundred and fifty years in the future, life as we know it is threatened by the arrival of Evil. Only the fifth element (played by Milla Jovovich) can stop the Evil from extinguishing life, as it tries to do every five thousand years. She is helped by ex-soldier, current-cab-driver, Corben Dallas (played by Bruce Willis), who is, in turn, helped by Prince/Arsenio clone, Ruby Rohd. Unfortunately, Evil is being assisted by Mr. Zorg (Gary Oldman), who seeks to profit from the chaos that Evil will bring, and his alien Mercenaries. Awards: Nominated for Best Sound Effects Editing. Box Office: Budget: $90 million. Opening Weekend: $17.031 million (2500 screens). Domestic Gross: $63.54 million. DVD: Widescreen 2.35:1/16x9, Fullscreen 1.33:1; audio English Dolby Digital 5.1 & Dolby Surround 2.0, Spanish Dolby Surround 2.0; subtitles English, Spanish; closed-captioned; double sided - single layered; 36 chapters; rated PG-13; 126 min. ; $19.95; street date 12/9/97. Over the years Bruce Willis became pigeonholed as an action hero along the same lines as folks like Schwarzenegger and Stallone. Yes, the man made a lot of action flicks. Starting with Die Hard in 1988, he starred in two sequels to that classic as well as a slew of more forgettable offerings such as 1991’s The Last Boy Scout and 1993’s Striking Distance. However, Willis’ career really bears little resemblance to these other actors who appear in much more monotone works. A quick run-through of his résumé establishes the surprisingly daring choices he’s made over the years. From 1994’s Pulp Fiction to 1995’s 12 Monkeys to 1999’s The Sixth Sense, Willis has appeared in quite a few films that stand out from the norm. Even when he took what seemed to be a conventional path, the truth sometimes was different. 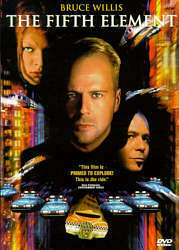 Take the first of his two 1997 releases, The Fifth Element. On the surface, this looked like just another brain-dead actioner, albeit one that used a science fiction motif. When examined, the plot seems pretty generic. Essentially an evil force is coming to Earth to annihilate all life. A special weapon called the Fifth Element can stop this, but some opposition stands in the way. As cab driver/former military stalwart Korben Dallas, Willis has to save the day. That brief synopsis didn’t come from a conscious attempt by me to sum up the story quickly; that’s really about all you get in Element. No wonder the movie looked like it might be a silly clunker. However, the reality completely differed from the first impression, as Element offered one of the most entertaining and inventive sci-fi experiences I’ve seen in a long time. Yes, the plot may be shopworn, but the execution lifted this sucker to a much higher level. As directed by Luc Besson - who also did the excellent action flick Leon - Element gleefully appropriates imagery from other films but somehow manages to make it all seem new and fresh. You’ll see many lifts from flicks like Star Wars and Blade Runner - some obvious, some not - as well as smaller nicks from a mix of additional movies. However, none of these felt like theft, as Besson clearly used them as a combination of homage and spoof. They existed as clever tips of the cap and made the experience seem all the more rich and vibrant without any hint of cheapness. Really, Element is a wonderful example of how much can be done with thin material. Besson made the film such a fascinating cornucopia of styles and attitudes and played it off with such merry charm and slickness that it consistently entertained and delighted. Actually, I will admit the first half of the movie dragged a little at times. Don’t get me wrong; I thought that section worked well and had some good moments. However, during repeated viewings of the flick, I consistently felt a little uninvolved during the first hour or so. I enjoyed the material but it no longer grabbed me by the lapels. That situation changed immensely in the movie’s second hour. Once all of the exposition and set-up were out of the way, Besson was able to really get into the action and have fun, and the second half of Element offered a nearly-nonstop thrill ride packed with great action, funny material and even some touching interludes. The romance between Dallas and Leeloo (Milla Jovovich) - the Fifth Element - stayed in the backseat for the most part, and some parts of it felt a little forced, but when push came to shove, I bought it and thought it worked. Part of the responsibility for the success came from the actors. On occasion, I will admit that Willis seemed miscast as Dallas. Every once in a while I thought it seemed like he was in a different movie than everyone else; his tough guy action star vibe didn’t always mesh with the piece. However, he integrated well enough into the material to make most of these issues moot, and he offered a strong and heroic presence that the story needed; we must believe that Korben has the power within him to save the universe, so it was better that Besson chose a rough character with a lighter side than tried to make a more loose and comic performer seem tough. Jovovich comes from the modeling world, and I will admit I’ve often been skeptical of her talents. However, she consistently provides good performances in her films, and I really liked her work as Leeloo. Jovovich managed to keep the part from becoming excessively silly or comic, but she also had a lot of fun when appropriate; I still get a chuckle out of her incessant repetitions of the phrase “multipass”. Jovovich provided a solid action presence when necessary as well; she pulled off her fight scenes with aplomb. Personally, I don’t consider her attractive enough to consider her as “perfect”, but she did very well in this role. As usual, Gary Oldman neatly immersed himself into the role as the film’s human villain Korg. With a vaguely Hitler-esque hairstyle and an incongruous Southern accent, Oldman hammed up his scenes just enough to make Korg broad and memorable without coming across as an insignificant goof. Korg seem just ruthless and vicious enough; yeah, he was a caricature, but that sort of performance made perfect sense in this film, and Oldman provided a memorable piece of work. Unquestionably the most controversial aspect of Element stemmed from Chris Tucker’s over-the-top acting as deejay Ruby Rhod. We don’t really meet Rhod until the movie’s third act; we saw a little of him in some earlier ads, but the character didn’t formally enter until much later. Many folks love Element except for Tucker; they find his performance to be out of place and absurd. Well, yeah - that was the point. Frankly, I’m not sure I understand how anyone could like the rest of Element but hate Ruby Rhod. The character fit in so perfectly with the wild and maniacal tone of the rest of the movie that I never understood the complaints. From the first time I saw the film, I thought Tucker was a riot; he seemed so ridiculously obnoxious and annoying that I instantly liked him. Rhod continues to offer some of my favorite parts of the movie, and I never felt as though he didn’t belong; the tone of the flick perfectly matched his frantic efforts, and I thought Tucker meshed nicely. Really, I found very little to dislike about The Fifth Element. Before I screened the DVD for this review, I hadn’t seen the flick in a few years, but I enjoyed it just as much now as I did in the past. In addition, I had to watch Element twice within a short period of time; soon after I checked it out for this article, I needed to view it again to rate the new Superbit release. I expected to feel bored and want to skip large chunks; after all, I’ve seen the movie five or six times, and with the last examination being so recent I didn’t think I’d be very entertained. I went through the same process with the original and the Superbit releases of Air Force One and wasn’t too excited the second time. However, Air Force One offered a fairly superficial experience; while it was a good action flick, what you saw was what you got, with virtually nothing to dig up from beneath the surface. The same wasn’t true for The Fifth Element. Besson packed the screen with so many fascinating visual elements and other bits that I always find something new when I watch it. Each subsequent viewing gives me another great moment onto which I can latch, such as the hilarious way in which Right Arm (Tricky) impersonates Korben; it’s a tiny bit, but I thought it was terrific. The Fifth Element teemed with such pieces, and it offered a truly fun and entertaining flick that I think will continue to look good for years to come. Inane trivia note: Gary Oldman appears in Air Force One and The Fifth Element, both of which came out within months of each other. In both flicks, a character refers to him as a monster. I’d love to know if this was simply coincidental; I suspect it was, but who knows? The Fifth Element appears in both an aspect ratio of approximately 2.35:1 and in a fullscreen version on this single-sided, double-layered DVD; the widescreen image has been enhanced for 16X9 televisions. Only the widescreen picture was reviewed for this article. Although the DVD long stood as one of the most popular demo discs on the market, many other superior platters currently exist. Nonetheless, Element has held up very well and it still provides a strong image. Sharpness looked excellent throughout the film. At no time did I discern any sign of softness or fuzziness. The image remained crisp and distinct at all times. I noticed no jagged edges, but some minor moiré effects occurred on occasion, and I also witnessed a smidgen of edge enhancement in a few shots. Print flaws remained consistently insignificant. The movie showed a few speckles and a little grit, and it also displayed one or two streaks and scratches. Nonetheless, the majority of the film seemed clean and fresh. Colors offered a highlight of Element. The movie featured a wonderfully broad and varied palette, and the hues consistently seemed vibrant and lively. I’d like to recommend a particular section, but the whole movie was a delight in that regard; colors always came across as truly dazzling. Black levels appeared to be deep and rich, and shadow detail seemed clear with appropriate density; low-light situations demonstrated good definition. Ultimately, The Fifth Element may not be the greatest DVD image out there, but it still offered a very satisfying visual experience. Also terrific was the Dolby Digital 5.1 soundtrack of The Fifth Element. As befits a big action/sci-fi flick such as this, the soundfield provided an extremely active and engaging setting. All five channels received a solid workout, but the track never seemed to offer any gratuitous audio; the various elements existed to create a vivid and engrossing whole. Music showed fine stereo separation across the front speakers and also cropped up with good support from the rear. Where the DVD of The Fifth Element flopped related to its extras: there aren’t any. No commentary, no documentary, no deleted scenes - not even a crummy trailer! Geez, the booklet didn’t even provide any cursory production notes; it gave us a quick blurb about the film and some photos but nothing else. Unfortunately, this doesn’t seem likely to change. Allegedly director Luc Besson doesn’t care for DVD supplements, so like Woody Allen, his discs remain largely devoid of extras; 1999’s The Messenger snuck in a short “making of” program, but otherwise these packages stay almost totally empty. While the lack of a special edition continues to disappoint, the movie itself seems strong enough to overcome that flaw. The Fifth Element is a rare beast, a film that appropriates a wealth of genre clichés but combines them into a wonderfully fresh and entertaining piece. The DVD provides consistently strong picture and sound, though it comes with absolutely no extras. Nonetheless, The Fifth Element is a terrific piece of work that holds up well to repeated viewings. It belongs in the collection of all sci-fi fans.